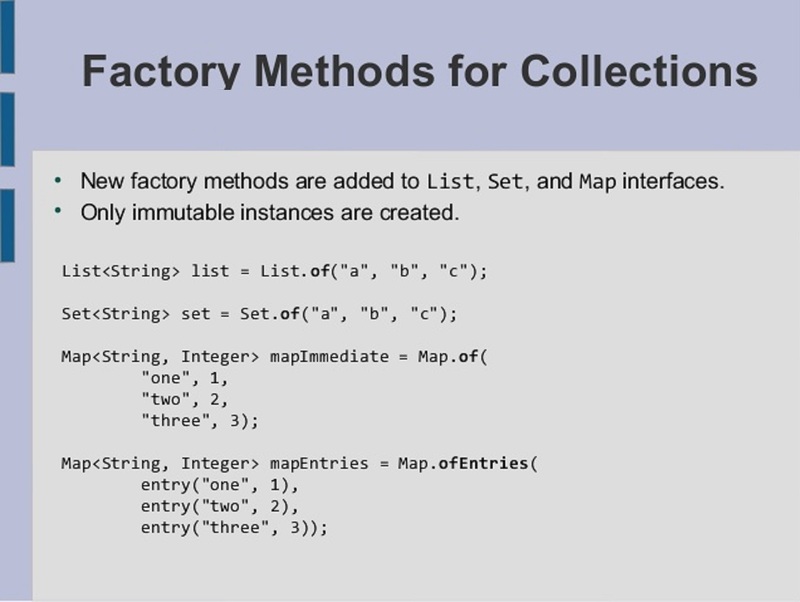 Check out JDK 9's static factory methods on Collection interfaces. See what they offer, how to use them, and some general tips for usage. Today, you'll learn about my favorite Java 9 feature "factory methods for collection", which is introduced as part of JEP 269. If you have worked in Groovy or Kotlin, then you know that how easy is to create a list with elements using collection literals, e.g. to create a list of 1, 2, 3, you can simply write val items = listOf(1, 2, 3). Unfortunately, Java doesn't support that yet, but things have been improved with factory methods for collection in JDK 9, and it's almost like that. 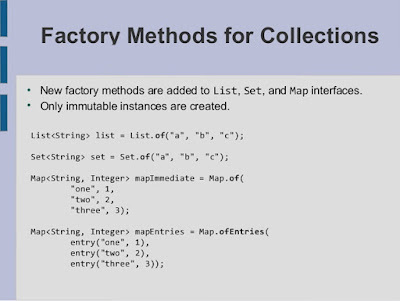 The JDK has added static factory methods like of() onto basic Collection interfaces, which you can use to create a list of items. But the only catch is that you can create an unmodifiable or immutable List, Set, or Map. The List, Set, or Map returned by the of() static factory method is structurally immutable, which means you cannot add, remove, or change elements once added. Calling any mutator method will always cause an UnsupportedOperationException to be thrown. However, if the contained elements are themselves mutable, this may cause the Collection to behave inconsistently or its contents to appear to change. The list returned by the unmodifiableList() method also doesn't support add, remove, or set operations and throws an UnsupportedOperationException if you call them. The only difference between two code snippets is that earlier, it required more than 6 lines of code to create an immutable Collection, e.g. an immutable List, Set, or Map, but now you can do that in just one line. There are also several overloaded versions of List.of() is available on the List interface, e.g. to allow you to create an immutable list of 1-10 elements and a variable argument method, which allows you to create the list of any number of elements. This method is overloaded to create a map of up to 10 key-value pairs, but if you need a bigger map with more mapping, then you should use the Map.ofEntries() method. By the way, do you know how this feature is implemented? And why it wasn't available before? If you look at the JDK 9 code or Javadocs, then you will find that this feature is implemented by adding static factory methods on key interfaces of the Java Collection framework, e.g. List, Set, and Map. This wasn't possible until JDK 8 because adding a method on the interface means breaking all its clients — and static methods were not allowed on the interface. Things changed in Java 8 with the introduction of default and static methods on the interface, which paved the way for evaluating the JDK API. I hope more similar enchantment will come in future which makes using JDK API even easier. Also, the rules that apply to the use of the different collections also apply (as you would expect) when using these factory methods. So, you cannot pass a duplicate element when you create a Set because a Set doesn't allow duplicates. Also, you can't pass a null value to the collection factory method. That's all about how to create an immutable list, set, and map in Java 9. The static method on collections has really made using the Java Collection API easier, and at least it's now similar to what Kotlin or Groovy offer. JDK 9 is full of such useful features, and stay tuned for more of such articles. If you can't wait, check out What's New in Java 9 — Modules and more, which provides a nice overview of all JDK 9 features. Published at DZone with permission of Javin Paul , DZone MVB. See the original article here.